Our matched betting calculator is one of the most important tools for matched bettors. Use our lay bet calculator to work out the exact amount your lay stake should be, how much your liability will be and above all, how much guaranteed profit you’ll make. We’ve made our lay bet calculator free for anyone to use, so read on to find out how you can benefit from using this tool. Not sure what matched betting is? Check out this article and start making money online today. No matter which bet type you pick, the lay bet calculator tells you the exact outcome for either a bookie (back bet) win or an exchange (lay bet) win. The matched betting calculator is designed to maximise your profit from each bet type. Lay bet calculator – Why do we need one? The maths behind no risk matched betting is rather complicated and working out the correct numbers for each bet individually would be a time consuming process. That’s where our lay bet calculator comes in handy. The calculator makes the whole matched betting process more efficient by saving time and allowing you to work out the most profitable bets. All of which helps you maximise your income in 2019. Before we look at how to use the risk free bet calculator, let’s go through the terms used in the tool. Back stake – This is the amount you bet at the bookmaker. Back odds – The odds of a selected market at the bookie. Lay odds – The odds of a selected market at the betting exchange. Back commission – This is the percentage of net winnings the bookie takes, almost always zero. Lay commission – Percentage of net winnings the betting exchange take, 2% for Smarkets and 5% for Betfair (more on this below). Stake returned (for free bets) – Sometimes the bookies return the stake from a free bet, however this is quite rare. Therefore you won’t need to touch the Stake Returned box very often. Refund (for risk free bets) – The amount the bookie refund you on a losing bet. Lay stake required – This is the amount you need to bet at the betting exchange. The risk free bet calculator works out the required lay stake to either minimise losses or maximise profits depending on what bet type you select. Our matched betting calculator, sometimes called a back lay calculator, lay bet calculator or a risk free bet calculator does all the complex maths for you and it’s incredibly easy to use. Note, the ‘Calculate’ button will only show once the required figures have been entered. The lay bet calculator works out the most effective lay stake to minimise your loss from this bet. Use this bet type when you have a free bet from a bookmaker or betting exchange. The calculator works out the lay stake to maximise your profit from the free bet. Typically you should aim to extract 80% from the free bet. Our matched betting calculator also allows you to differentiate between a stake returned free bet and a stake not returned free bet. This added functionality ensures you maximise your profit from every free bet out there. However, the stake returned box can generally be left unchecked. Use this bet type when completing a risk free bet. You’ll receive your refund either in the form of a free bet or a straight cash deposit into your account. If it’s a straight cash refund, enter the same amount (in the refund box) as the back stake. If your refund is in the form of a free bet, you need to multiply the back stake by 0.8 as you’ll aim to extract 80% from the refunded free bet. The risk free bet calculator will work out the optimal lay stake to maximise your profit from this bet. The amount of commission you pay varies depending on which betting exchange you’re using. 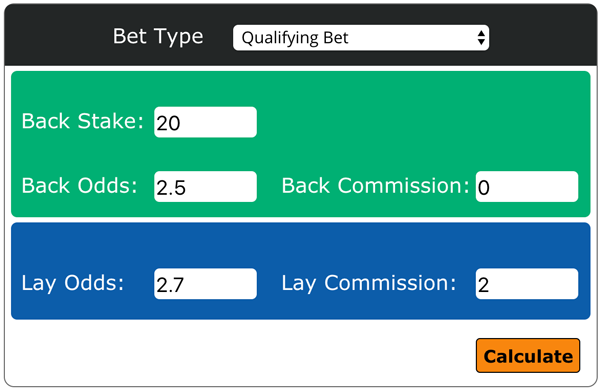 Note: The lay commission in our back lay calculator has a default set to 2% to account for the Smarkets commission rate. If you use another betting exchange like Betfair you can simply alter this amount accordingly. 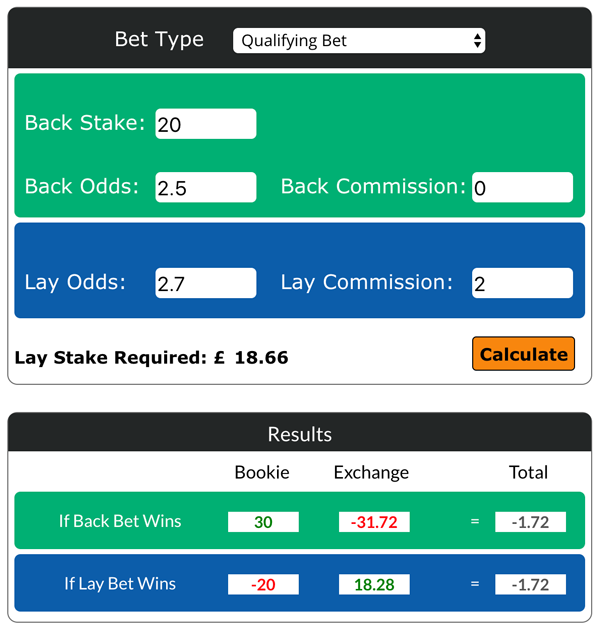 Unlike other matched betting calculators our back lay calculator lets you alter the back commission. This is useful if you want to place a back bet at a betting exchange. The calculator has a default value of 0% for the back commission so change it accordingly if you need to. If you’re not sure what I’m on about, I recommend you check out our matched betting guide. Use these matched betting calculator tips to ensure you get the most out of this awesome tool. Our first tip is to always use the back lay calculator. This one might seem a little self explanatory, however, you’ll be surprised at the number of people who don’t use the matched bet calculator enough. As you progress with your no risk matched betting and become more experienced, you may feel you can calculate your own stakes. Arguably you probably could, however, this is something I would strongly avoid doing. It can lead to costly, unnecessary mistakes which could impact your profitability. Therefore, whether you’re completing a qualifying bet, a free bet, a risk free bet or a price boost, make sure you use the lay bet calculator. All in all, stick with the matched betting calculator and you’ll be in safe hands when it comes to working out your overall profit and lay stakes. The matched betting calculator is an awesome tool. However, it only works out the optimal results based on the numbers you input (what you actually enter into the calculator). Therefore, as with anything in matched betting, it’s important to double check everything. This includes checking over the match bet calculator to ensure you’ve entered everything correctly. One slight mistake could significantly alter the outcome of your bets and potentially leave large amounts of profit on the table. If you like using multiple betting exchanges, always double check the exchange (lay) commission rate. You’re probably aware the commission rate changes between different betting exchanges. As I mentioned above, the lay commission on our betting calculator has a default set to 2% to account for the Smarkets commission. However, you can change this as and when you need to. For more awesome matched betting tips, check out this article. To help you get started with using the calculator, here’s an example you can follow. Once you’ve found an offer or free bet to complete you’ll next need to find a market to place your back and lay bets. If you’re unsure how to do this, I suggest you check out this article. When you’ve found a suitable market, you’ll need to enter the back and lay odds into the calculator to work out the profitability of the market. The next step is to enter the odds into the calculator. As I mentioned above, if you’re using the Smarkets exchange you can leave the commission rate set at 2%. If you’re using another betting exchange, change this figure accordingly. I’m using Smarkets, so I’ll leave the commission alone. The matched bet calculator suggests I place a lay bet of £18.66, I’ll lose a total of £1.72 qualifying for my £20 free bet and I need a total of £31.72 in my Smarkets account to be able to place this bet. In this scenario, I’d want to look for some better odds in the aim of decreasing the qualifying loss. Once I’m happy with the loss, I’ll go ahead and place my bets. This entire process would be considerably harder without the use of the risk free bet calculator. It’s certainly a key part of any successful matched betting strategy. Matched betting is the number one way to make money online in 2019. Period. However, for some beginners, starting no risk matched betting can be a challenging concept. This is why it’s advisable to sign up to a matched betting site like The Sure Bettor. It really does pay to join one of the best matched betting sites around. You can find out what our existing members think here. If you’re unsure about any of the terms we’ve used above, be sure to check out the articles below or head to the matched betting blog where you’ll find all the latest news and information. In the meantime enjoy using our matched betting calculator.